^ 1.0 1.1 1.2 1.3 1.4 1.5 Atkinson, William. Mumps Epidemiology and Prevention of Vaccine-Preventable Diseases 12. Public Health Foundation. May 2012: Chapter 14. ISBN 978-0-9832631-3-5. ^ 2.00 2.01 2.02 2.03 2.04 2.05 2.06 2.07 2.08 2.09 2.10 2.11 Mumps virus vaccines. (PDF). Weekly epidemiological record. 16 February 2007, 82 (7): 49–60. PMID 17304707. ^ 4.0 4.1 Gupta, RK; Best, J; MacMahon, E. Mumps and the UK epidemic 2005.. BMJ (Clinical research ed.). 14 May 2005, 330 (7500): 1132–5. PMC 557899. PMID 15891229. doi:10.1136/bmj.330.7500.1132. ^ Kutty PK, Kyaw MH, Dayan GH, Brady MT, Bocchini JA, Reef SE, Bellini WJ, Seward JF. Guidance for isolation precautions for mumps in the United States: a review of the scientific basis for policy change. Clinical Infectious Diseases. 15 June 2010, 50 (12): 1619–28. PMID 20455692. doi:10.1086/652770. ^ 6.0 6.1 Sen2008 SN. 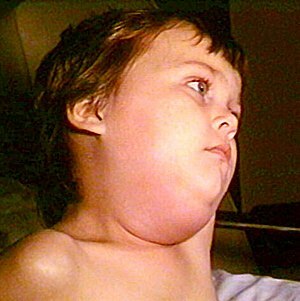 Mumps: a resurgent disease with protean manifestations. Med J Aust. 2008, 189 (8): 456–9. PMID 18928441. ^ Junghanss, Thomas. Manson's tropical diseases. 23rd. Oxford: Elsevier/Saunders. 2013: 261. ISBN 978-0-7020-5306-1. ^ 8.0 8.1 8.2 8.3 8.4 8.5 8.6 Senanayake SN. Mumps: a resurgent disease with protean manifestations. Med J Aust. 2008, 189 (8): 456–9. PMID 18928441.